“Recovery in Worcester” on Unity Radio will announce the future broadcast of its premier show and station debut at 4 p.m. Oct. 24 at the YWCA of Central Massachusetts, 1 Salem Square. Together with grassroots support, Unity Radio aims to identify and raise awareness of community needs, create forums for public dialog, as well as promote a strong, engaged and inclusive community. “In pursuing its goal of serving the public interest, the station will adopt an alternative programming format that combines interviews with treatment professionals and people in recovery with coverage of recovery events to spark public dialogue about substance use prevention and treatment, while demonstrating compassion regarding recovery,” said Ernie Floyd, executive producer.Carmen Hicks, host of “Recovery in Worcester,” is a registered nurse at UMass Memorial Medical Center in Worcester. The featured guests on the premier show are: Girls Choice, a YWCA youth program, and James Hicks, a peer leader at Central Mass. Recovery Learning Community KIVA Center. Other guests include Stephanie Pratico, clinical supervisor at AdCare Outpatient Services Worcester; Worcester City Councilor Kate Toomey, community services representative; and Mary Beth Papcsy, public relations specialist for AdCare. 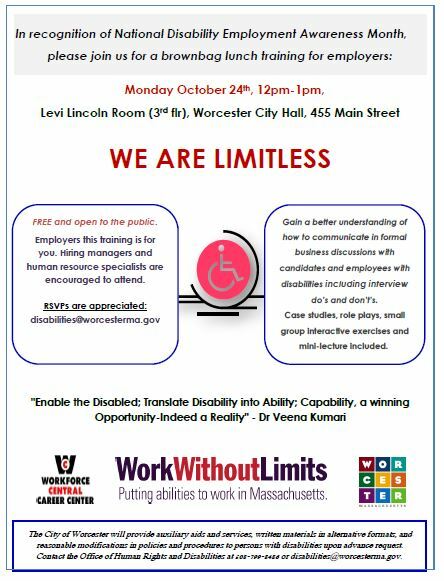 In recognition of National Disability Employment Awareness Month, the city of Worcester Office of Human Rights & Disabilities will hold a brown-bag lunch training for employers from noon to 1 p.m. Monday, Oct. 24, in the Levi Lincoln Chamber of City Hall. Hiring managers and human resources specialists will gain a better understanding of how to communicate in formal business discussions with candidates and employees with disabilities, including interview do’s and don’ts. People with disabilities have been an underserved part of the job-seeking community. There are many talented individuals looking for employment and many companies looking for a good fit for their organizations. Attend this free one-hour training to learn some helpful tips, review case studies and engage in role plays and small group interactive exercises. 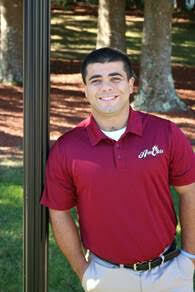 Anna Maria College has named Paulo Salgueiro Jr., a senior studying criminal justice, as a student representative to its Board of Trustees to build on the college’s efforts to prepare students to serve the communities in which they live and work. Salgueiro is the first student to receive a board appointment. Anna Maria’s Board of Trustees recently added the student seat to recognize the important voice that students have in college governance. Clark University will present “Holocaust History and Survivor Testimony,” a lecture by professor and author Christopher Browning, beginning at 7:30 p.m. Wednesday, Oct. 26, in Tilton Hall in the Higgins University Center, 950 Main St.
Browning is the Frank Porter Graham Professor Emeritus at the University of North Carolina at Chapel Hill. 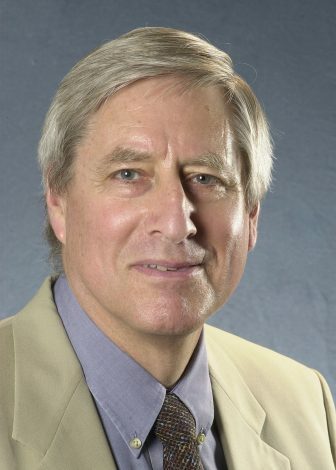 Using findings from his more recent book, “Remembering Survival: Inside a Nazi Slave Labor Camp,” which analyzes the testimonies of the almost 300 camp survivors, Browning will discuss the methodological challenges of using oral testimony to document Nazi crimes.